The 13.7 figure was plucked out of a 5-gallon fish bowl by the North Dakota Industrial Commission, on Dec. 9, 2014. The new regulation became effective April 1, 2015, but it was merely window dressing to placate somebody. The oil companies? I guess, because, as a supposed safety measure, to make the Bakken oil trains not explode every time they derailed, the new maximum vapor pressure was and is a joke. Because the trains still blow up. And 90 percent of the Bakken oil tankers that have derailed and released fireballs in all directions — killed people, burned buildings, and fouled water — were below, sometimes well below, the 13.7 standard. So what’s the damn point if the limbo stick for producers is 10 feet high? After the new Vapor Pressure rule, a Bakken oil train derailed and exploded near Heimdal, N.D., in May 2015. By the time photographers got to the scene, just left of nowhere, the flames were still 100 feet high. The Vapor Pressure was 10.8, so the 13.7 was proven as a failure within weeks. If you as owner tell your bartender to throw out any customer who drinks over 13.7 beers, but he gives her the toss at 10.8 beers, if they’ve pounded just 10.0 beers, or if Humphrey sipped on 9.33 cans or even if he only drinks 7.83 Grain Belts, you’ve numerous issues. A) Someone you know can’t count. B) You’re losing scads of money. C) Your enterprise is operated on the on debunked “Random Number Theory” and you’ll be shut down faster than a Trump Casino. D) Things are wrong with you, man. Get help. The last incident took place on June 7, 2016. Below is a paragraph from an earlier column. Well, that’s quite a while ago. Maybe the explosion problem has disappeared. Maybe, but why think that? It was five years between the exploding of three tankers full Bakken crude in a short mixed cargo train outside of Luther, Okla., in 2008, and the tragic human cremation of 47 people disaster at Lac-Megantic, Quebec, in 2013, so the Bakken enhanced fluid trains don’t derail and detonate on schedule. The number of oil trains has decreased, as the pipeline capacity increased, but experts say that trains will always be an option because they allow flexibility in shipping to where the highest price can be found. No pipelines are in the works to cross the Rockies to the Pacific, where much of the Bakken crude is exported. Many towns along the ocean want nothing to do with the bubbly stuff. And pipelines go one way and most have more stringent vapor pressure requirements than the state. For crude, the allowable Reid Vapor Pressure according to the Feds is 10.0. So evidently, the oil people can lower the vapor pressure if they please. In fact, North Dakota Petroleum Council underwrote a study, “The North Dakota Petroleum Council Study on Bakken Crude Properties,” produced by the energy consulting firm. Turner Mason & Company, which claimed that the vapor pressure of Bakken crude was 7.83 psi, which could easily be the case if they stripped out everything but the carbon, hydrogen and small amounts of nitrogen, oxygen and various metals. I’m not a chemist, but you get what I’m saying. So let’s just scrap all of this purposely confusing vapor pressure stuff for the oil trains and do what the North Dakota Petroleum Council did for their report. Strip out every element but the carbon, hydrogen, nitrogen, and oxygen. The crude oil. And leave no propane, butane, methane, ethane, or other natural gas liquids. Propane alone has a vapor pressure of 208, so you do the math. One of the authors of the study said the oil wouldn’t even light, which is pretty much what we wild-eyed public safety advocates have wanted. “If I threw a match into Bakken crude oil it would not ignite it.” —John Auers, executive vice president of Turner, Mason & Company (the lobbying entity for the Bakken oil producers) who wrote the report for the North Dakota Petroleum Council. So, it’s possible. Then, it must be done. It’s too much of a gamble, otherwise. The cost is not the taxpayer’s problem. The poor oil barons don’t have the right to run a dangerous, but fixable, product through our committees. Pssst. Nothing is going to change. Anyway, Auers said this in front of the Science, Space and Technology Congressional Committee, so we know it’s true, on September 9, 2014, a meeting that then-congressman Cramer claimed to have set up, specifically to lend cover to the oil industry for blowing up people and property. For his part, he invited lobbyists, instead of scientists, to testify. Either way, it was sham. Really? These clowns can’t figure this out? I know half of them may think the earth is only 6,000 years old, but geez. Pictures and video shows the explosions and aftermath of all Bakken train derailments up to Mosier. Except for Aliceville, Ala., which only has eyewitness accounts of 300-foot tall balls of fire and photos of the wreckage. Have an Ichthyologist take a gander. No scientists or congressional hearings were needed to determine the danger of a Bakken oil + NGLs train, when a child could see what happened every time there was a derailment previous to Cramer’s shameless government funded lobbying. Evidence of it all is on Google images and YouTube. Was/is it Cramer’s contention that large bomb detonations are safe? It seems so. I hope he doesn’t tell Trump about the safe explosions. That poor meathead doesn’t need any ideas. Oh, so that’s how you get Harold Hamm to be your campaign finance chairman. Who were North Dakota regulators, lawmakers, and officials that didn’t see giant red flags as threats to the citizens, instead of a public relations problem? All but one of them and she moved. Lynchburg, Va., April 30. Right in town, there were towering fireballs before the tankers tipped into the James River. Yummy for the river life. Outside of Casselton, N.D., Dec. 30, 2013. (10.0 rvp) Well-known. Too many lawmakers still think of Casselton as the first event, but it was the fourth. And some people were/are in cahoots. Who knows how it works. Maybe one-third of the Industrial Commission has to call in a report to the Petroleum Council every hour. Or not. I have no clue. The state guy doesn’t think that the oil guys don’t know the composition of their product? That’s adorable. But besides collusion between industry and government, the concern is about getting bad press. Instead, N.D. taxpayers watch their legislators give the oil and incendiary gas comminglers a tax cut. Outside of Aliceville, Ala., Nov. 8, 2013. Delicate water ecosystems are poisoned. Lac-Megantic, Quebec, July 3, 2013. (9.33 rvp) Sixty-three tank cars spilled more than 1.3 million gallons of oil. Forty-seven people were killed and 30 buildings destroyed. Outside of Luther, Okla., Aug. 22, 2008. Fireballs caught on video by a news helicopter from Oklahoma City. McClatchey and The Associated Press reported the source of the crude as Fairview, Mont. One didn’t explode, because a spark didn’t reach a gas, or the train hadn’t traveled far enough to allow the natural gas liquids (NGLs) to gasify. Is a 90 percent denotation rate something to brag about now. I’m not counting the next one although it got a lot of people worked up. Bakken crude tankers tipped to a 45-degree angle off the tracks July 24, 2014, and everyone in Seattle rightfully freaked out. “When energy companies started extracting oil from shale formations in South Texas a few years ago, they invested hundreds of millions of dollars to make the volatile crude safer to handle. In North Dakota’s Bakken shale oil field, nobody installed the necessary equipment. The result is that the second-fastest growing source of crude in the U.S. is producing oil that pipelines often would reject as too dangerous to transport. 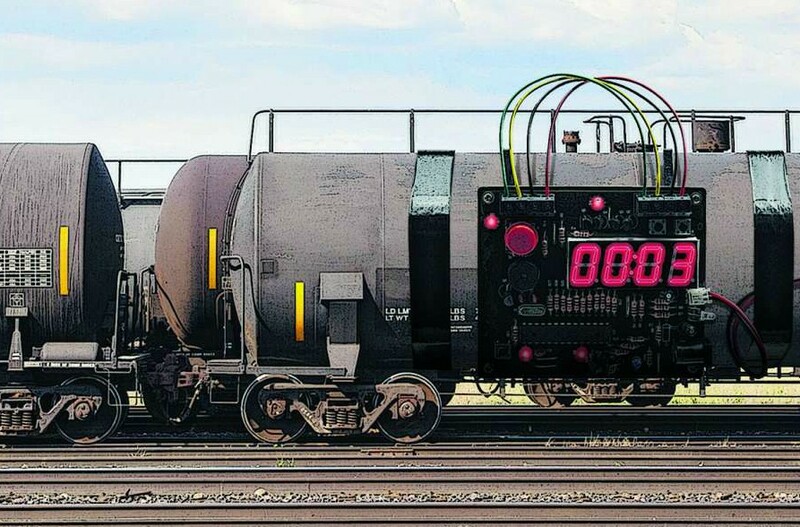 Now the decision not to build the equipment is coming back to haunt the oil industry as the federal government seeks to prevent fiery accidents of trains laden with North Dakota oil. Investigators probing crude-by-rail accidents, including one a year ago that killed 47 people in Quebec, are trying to determine why shale oil has proved so combustible — a question that has taken on growing urgency as rail shipments rise. Only one stabilizer, which can remove the most volatile gases before transport, has been built in North Dakota, and it hasn’t begun operation, according to a review by The Wall Street Journal. Have you ever had a positive comment or day in your life?